As we leave Bali, we have one day and a half in Singapore to rest up before the long flight home. Chuck has been here for business many times and loves this city for the diversity of food. It’s quite the drastic contrast of seeing the women at the farmers market, in the mud roads this morning dressed in a simple sarong, to the concrete jungle of high rises, fancy cars, shopping malls of high end designer labels, and people who care about who and what labels they are wearing this afternoon. 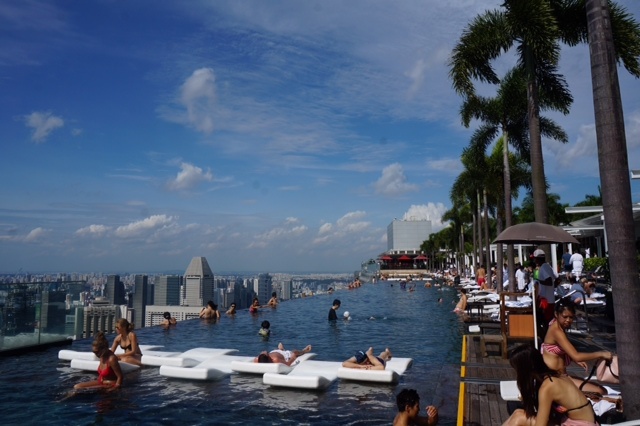 Chuck wanted to splurge and stay in the Marina Bay Sands Hotel, the newest hotel they’ve added to the Singapore skyline in the last three years. I saw it under construction the last time I was here. He thought it would be nice to relax for a day and a half before we head on that long flight home. Holy mackerel…what a hotel…that’s it, on the left, with the three towers, and the concrete sculptural lotus flower out in front. 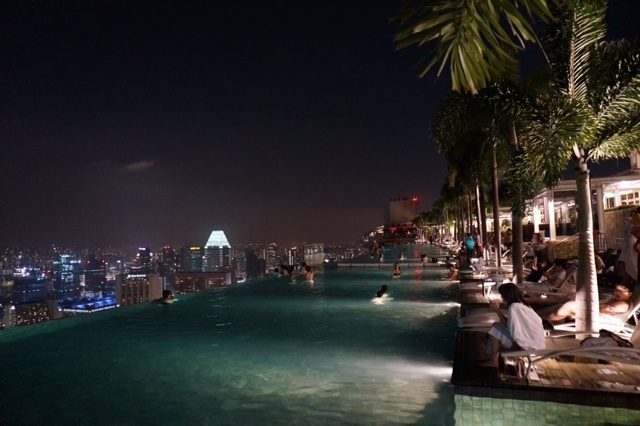 The long segment across the top is a rooftop, 57th floor swimming pool with an infinity edge, looking out over the city. Who thinks of these things?! We started with pool pictures, and I guess we are ending with pool pictures too. Our trip is over and we’ll be on a 5am flight home tomorrow morning. We leave on Dec 17th, fly for 20+ hours and when we get home, it will still be Dec 17th am. Funny how that works. This has been like Alice falling down the rabbit hole, and ending in a strange and unknown Wonderland. I hope all of you have enjoyed reading my emails and being part of the adventure with us. We always love hearing hearing from you and your comments.